The theme at CASology this week is “Spring” and the sketch at CAS(E) this sketch is a 2×3 array. I had fun combining the two in the card above. The watercolour panels were left over from my last class so I die cut little birds and flowers using dies from the ‘tweet things’ set to fit with the spring theme then arranged them according to the sketch. 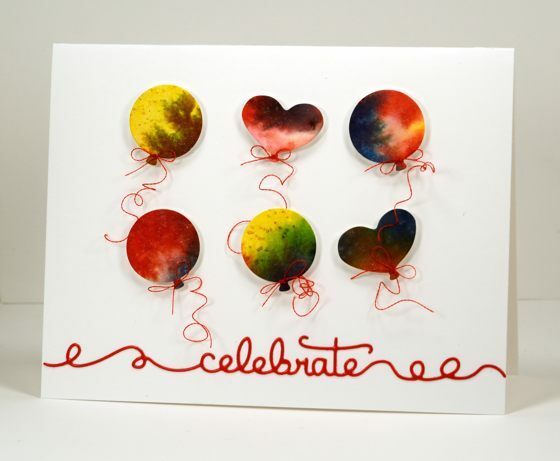 I don’t know that balloons are a spring thing but they do work perfectly for the sketch so I die cut some circle and heart balloons using dies from the ‘uplifting’ set, spent way too long tying six tiny bows of machine embroidery thread around the balloons then popped them up on dimensional tape. The embroidery thread is very shiny so I found the shiniest red cardstock I had and die cut the word celebrate from the ‘doodles’ set which works in well with the curls in the thread. We had amazing spring weather yesterday; my girls and I went for a run in beautiful 15°C sunshine. This morning we woke up to fresh snow so my husband skied this afternoon. Happy Easter everyone. I absolutely love your spring card Heather! Absolutely lovely depiction of the elements! so eye-catching and CAS. Happy Easter and thank you for sharing with us at CASology this week! Amazing cards. Both epitomize CAS and its principles. But you probably hear that all the time. Just wanted you to know how lovely and brilliant they are. 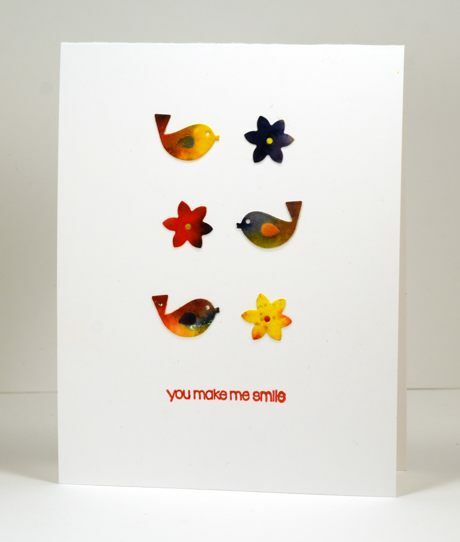 Your first card is perfect for spring! And I think balloons count if you want them to. 😉 I can just imagine the time it took to tie those bows, but they go so well with the sentiment, how could you not? So springy and cute! I love BOTH cards! Thanks for joining us this week at CASology! Fantastic!! Absolutely fantastic! I absolutely loved both your cards!! Great water coloring. I love all of the small pieces that brings your card together. Thanks for playing along with us this week at CASology. Heather, both of these cards are beyond wonderful! I love the cute birds and the pretty balloons. Super! Both of these totally make me smile! Fabulous job with the sketch! Wonderful takes on the sketch! Love the little icons and the strings on the balloons are so cool!